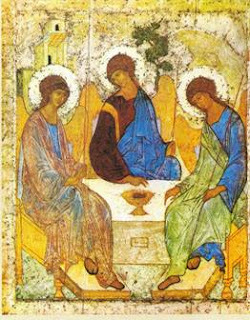 This is at first sight, a strange passage for Trinity Sunday: it should really be a reading for Pentecost because it is about the Spirit – about being led by the Spirit. But the Spirit cannot be separated from the Father or the Son. For a start, the Spirit here is described as ‘the Spirit’, as the ‘Spirit of God’ (v14), and as the ‘Spirit of Christ’ (v9). And we are told that the Spirit is the Spirit of adoption (v15): If we are led by the Spirit, we are adopted into God’s family. We are not, in our human fallen state, children of God – not children in that special way. But when the Spirit of God, or the Spirit of Christ, comes into our lives, when we receive the Spirit, we are born again – or ‘from above’ – by the Spirit. And we become adopted children in the family of God. And as people who have the Spirit, that means that we have all the privileges of being sons and daughters of God. And now we’re beginning to speak about Trinity. Holy Spirit is like a language teacher – a personal language tutor. Those of you who are language teachers, or who have had language teachers, will know that they have several tasks. They need to teach the skills of the language: the vocabulary and the grammar But they also need to teach their students how to live in the new language: how to see things in a new way, and how to think in a new way. This is our final week looking at giving. Today we are looking at the blessing of giving. 9.6: ‘The one who sows bountifully will also reap bountifully’. 9.8: ‘And God is able to provide you with every blessing in abundance’ 9.11: ‘You will be enriched in every way for your great generousity’. The Old Testament comes very close to saying that if you are generous, you will – in this life - receive back more than you give.